When Tacit was launched nearly a decade ago, our aim was simple: to provide clients with investment performance above UK RPI over rolling five year periods. Ultimately, the level of risk a client was willing to take in the short term would dictate how they fared over the longer against this objective. All clients, however risk taking, should only invest if they want to preserve the real value of their money. Otherwise bank deposits provide the right solution. A key tenet of the Tacit process is simplicity. This can be seen in the investments we select for clients and more importantly, investments we have not invested in for clients. Our approach has been to steer clear of manufactured returns of Hedge Funds and volatility trades in favor of traditional investments such as cash-flow driven Equities and Government Bonds. The interesting point illustrated in the chart below is that the majority of traditional assets (Equities, Bonds and Gold) have actually performed well (when compared to inflation) over the past five years. 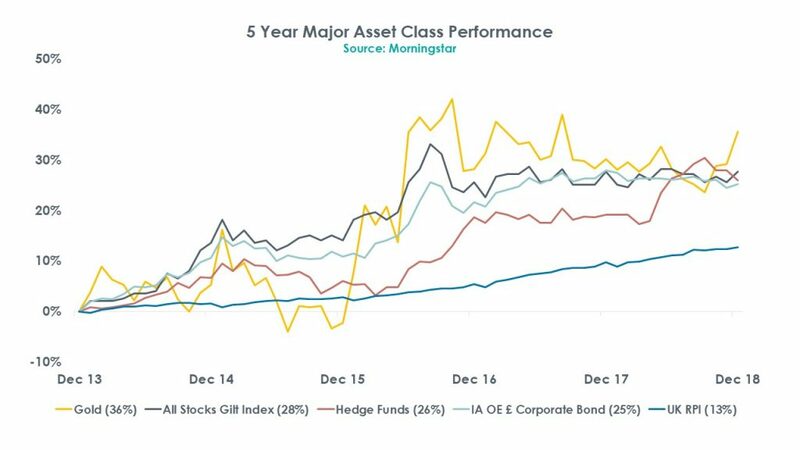 Now coming back to one of the major asset classes we have not owned for clients: Hedge Funds. This may well be a sensible investment for some investors, but the charges levied by these funds to retail investors are high and, as the chart shows, provided lower returns than our chosen Stabilisers (Gold and government bonds). In fact, the average charge is close to 10 times that charged by our chosen Stabilisers. Our clients have not needed an over-engineered process to preserve the real value of their investment portfolios previously and we firmly believe our focused, cost conscious approach to investing will provide positive real returns in the future. After a difficult period for absolute returns, reviewing our core principles is a sensible thing to do, however our conclusion remains the same.